MILLERSBURG - Bicyclists from across the nation brought their competitive edge to this Dauphin County community for the Tour de Millersburg on Aug. 13-14. According to Event Coordinator Christopher Dietz, there were205 riders registered to race. He called the event a “great success”. The weekend festivities included time trials, safety courses offered by the Millersburg Police Department, musical entertainment and various smaller races, in addition to the main event – the road race. 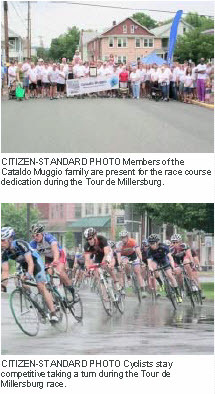 A new course, in memory of Cataldo Muggio, debuted this year as version 5.0 of the Tour de Millersburg Criterium. Members representing the Muggio family were present for the competition. Race results are listed below. Jeff Godfrey New Providence, PA 149 Thru-It-All Body Shop Inc.
Jeff Godfrey New Providence, PA 2:13:40 317722 207 Thru-It-All Body Shop Inc.
Jeff Godfrey New Providence, PA 49:13.0 Thru-It-All Body Shop Inc.